With bores sizes up to 4.185” and the capacity for a 4.500” stroke, 495 cu.in displacement is possible for our LS EDGE Solid block. And when it comes to engines, size does matter – not just in terms of how big the engine is on the inside, but also how small and economical it is on the outside. It’s unsurprising, therefore, that the LS engine series has made such huge waves in the motorsport community, incorporating large cubes into a sleek and streamlined external package. The new LS-Edge SOLID platform is the next step in that evolutionary process. The LS-Edge Solid is the perfect platform for power. 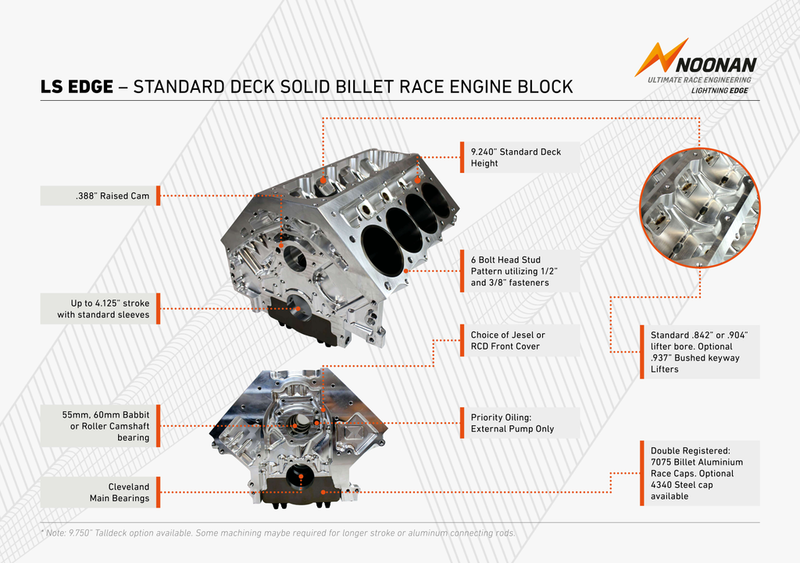 It incorporates a full billet Solid block, and this robust design enables allowing Horsepower outputs to reach unheard of levels with block integrity taken to the next level. Available in a 9.240" or 9.750” deck height, a raised camshaft, larger than stock mains and eye catching good looks to create the next must-have engine block for LS engine fanatics. The block architecture accommodates center counter weighted crankshafts with larger than standard counterweights to aid in providing a more stable rotating assembly. You can’t have speed without stability. Our insistence on using only the sturdiest materials underscores our commitment to building a rock-solid foundation for your racing engine. The 6 bolt LS head stud pattern incorporates ½” and 3/8” fasteners instead of the smaller standard hardware. A similar approach has been taken to the bottom end, where ½” fasteners are used for the main caps with 3/8” side bolts helping keep the billet steel main caps where they belong. Want to incorporate high horsepower turbo applications? We’ve thought ahead - the LS-Edge Solid has turbo pressure feed lines in the front of the valley and oil dump ports in the side of the block to return the oil to the sump. This is optimal not just for power, but also for longevity. Plumbing your turbo setup becomes simpler and neater, safeguarding your expensive investment. Great engines start with great blocks. You wouldn’t build your house on sand, so why settle for anything less than the LS-Edge Solid engine block from Noonan.